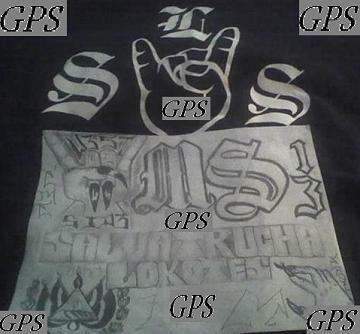 The Mara Salvatrucha gang is predominately made up of Salvadorans and other Central Americans and originated in the Los Angeles area, not El Salvador, but the gang was later exported back to that country. The group was started, in part, to protect themselves from the 18th Street gang. MS is also known as being very violent in Central America, but has been hyped up by the press and even some Law Enforcement in the U.S.A. Very few MS around today were ever in the Army as the Salvadoran "Civil War" started over 20 years ago and most MS are currently in their teens and would have been too young for that conflict. Many of their OG’s or Veteranos have been killed. MS will fight "Salvadorans With Pride" (SWP) and considers them their deadly enemy on the East Coast. Originally, many MS wore black for their "Santanas" roots and were known as "Stoners" and wore long hair. At first, MS did their own thing, which is why many of the OG's or Veteranos would just claim MS. By 1994, they fell under the Sureno umbrella, which is why you see many of the younger ones with MS13 and they started wearing blue and have more of a cholo look now. They may also wear light blue and white or beads from the colors of the Salvadoran flag. Some people today mistakenly believe all Salvadoran gang members are from MS, and that Salvadorans cannot be from Mexican varrios. Many Salvadorans may even think that MS is all Salvadoran. This is false. Recently, we have seen Mexicans, Guatemalans, Hondurans, and other Central Americans join MS, but not exclusively. Central American kids may choose to join MS more than other varrios. It depends on if they feel Mexicans or Salvadorans have done something against them. They may join MS or may join other Latino gangs. When deported, the MS has continued its illegal activity in El Salvador, and later in Guatemala, Honduras, and Mexico. Several Central American governments have recently outlawed them and much violence has ensued including major riots in jails and prisons which has left hundreds dead. They have been spotted in New York, Washington D.C., Texas, Seattle, and even in Vancouver, Canada. Recently, Immigration and Customs Enforcement (ICE) made sweeps of MS members in communities across the U.S. in an effort to stop their activities; however, many 2nd generation MS were born in the states and cannot be deported. They are our problem now!